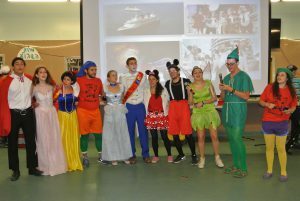 A little Disney magic descended on Machaneh Yavneh for one night before camp ended. As the chanichim entered the chadar ochel, I mean the Disney Cruise, on their last night for camp banquet, they were greeted by their Captain for the evening, Estelle Gomolka, and her First Mates, the madrichim, in special t-shirts designed just for the evening. 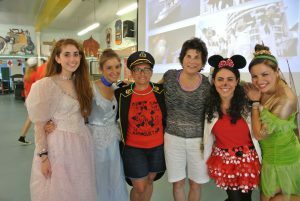 Of course, as head of the Agam, she couldn’t resist making it not just Disney, but a Disney cruise. “Everything is more fun with water!” she said. There was plenty of ruach, a live band, Disney centerpieces, and even Mickey Mouse ear cookies and Disney cupcakes. 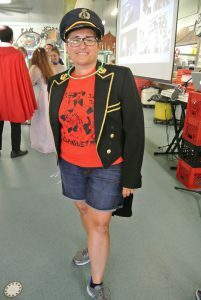 Gomolka remembers every banquet she’s organized. And if she forgets, she need only glance at the wall in her home away from home at camp, where one t-shirt from every banquet hangs on the wall. Some of her favorites have included Yavnopoly, when favorite camp spots were transformed into places to buy and sell on the Yavnopoly board, and Yavnehplex, when the chadar ochel became an old movie theater, complete with a full lighted marquis at the entrance. Then, Gomolka learned that among the chanichim this summer were the Kaplan children, who came to camp (one in Gurim, one in Kfirim) all the way from Dunwoody, Georgia. Their father, Dr. Jason Kaplan, an orthodontist, has been to Disney 15 times, even more times than Gomolka. (She has “only” been there about 5 times.) And he has earned a coveted spot on the Disney Mom’s panel. For the uninitiated, this is an online forum providing guidance to people planning trips to Disney. The positions are not salaried, but those on the panel receive in-kind reimbursement, like a trip to Disney. (The Kaplans will be taking their trip in October.) Dr. Kaplan explained, “Let’s say you’re going to Walt Disney World Resort during Pesach. You might post a question on the forum, ‘Where can I get kasher l’Pesach food at Disney?’ That question would likely get funneled to me, and I would provide an answer.” The questions can be more general as well. The Kaplans found Yavneh through fellow Georgian Jeff Weener, assistant director at camp. They liked the pluralistic approach, since the Kaplans were a combined marriage of Conservative and Reform denominations, and then together they wandered over to Orthodoxy. They were looking for a summer camp in the Northeast to get away from the southern heat, and Yavneh seemed like the perfect fit. Even better, their kids love it, he said.